Guides: "Lynn and Hussein our guide and driver were excellent, taking care to ensure we enjoyed the experience and Jacqui from Tribes local partner made us feel very welcome, almost part of the family. " The Rwandan people we met at the Mountain View Gorilla Lodge were great fun as we celebrated Shirley's birthday with drinks, cake and dancing. Start planning your tailor-made holiday to Rwanda. Tell us what you want, and we will tailor make your perfect trip.  Flight time: Various airlines fly to Kigali including Kenya Airways via Nairobi.  Language: Main language is Kinyarwanda but English is widely spoken. Many people also speak French or Swahili.  Visas: Entry visas are issued on arrival, entry fee is $30, to British passport holders. 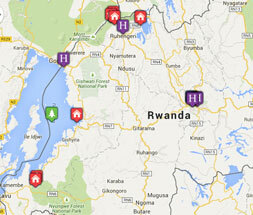  Health: Rwanda is a malarial country but the risk is low as most of the country is at high altitude. The following vaccinations are recommended: Hepatitis A & B, Polio, Tetanus & Typhoid. Yellow fever vaccinations is compulsory. Seek advise from your GP.